(Kansas City, Mo. – July 23, 2015) It was introduced to Kansas City as light rail on rubber tires. After failed elections to approve light rail, bus rapid transit – known in shorthand as BRT – started in Kansas City 10 years ago this Friday as a fresh new approach to public transportation. It offered residents service similar to rail, but at a much lower cost. The MAX service opened a new era of transit in Kansas City with buses running faster than ever before using designated lanes and making fewer stops. It featured sleek new bus shelters and, for the first time, gave bus riders electronic signs showing when the next bus would arrive. MAX buses now offer Wi-Fi services. The Kansas City Area Transportation Authority plans to celebrate MAX’s 10th birthday with passengers. Staffers will show up unannounced at various bus stops along the Main Street MAX route with special gifts for riders. The celebration will kick off during the morning rush hour Friday, July 24 and run through next week. Born at 5:02 a.m. on July 24, 2005, the MAX bus rapid transit service came to life on Kansas City’s Main Street corridor between downtown and the Country Club Plaza. Ten years later, MAX – short for Metro Area Express is still going strong. There have been more than 13 million boardings on Main Street MAX since it started operating in 2005. Ridership on Main Street MAX last year was 43 percent higher than it was in MAX’s first full year of operation in 2006. The new service cut the time it took for riders traveling from the Country Club Plaza to downtown by about 25 percent. Before MAX was introduced, it took riders about 24 minutes to cover that 5.5-mile route; after MAX it took about 18 minutes. 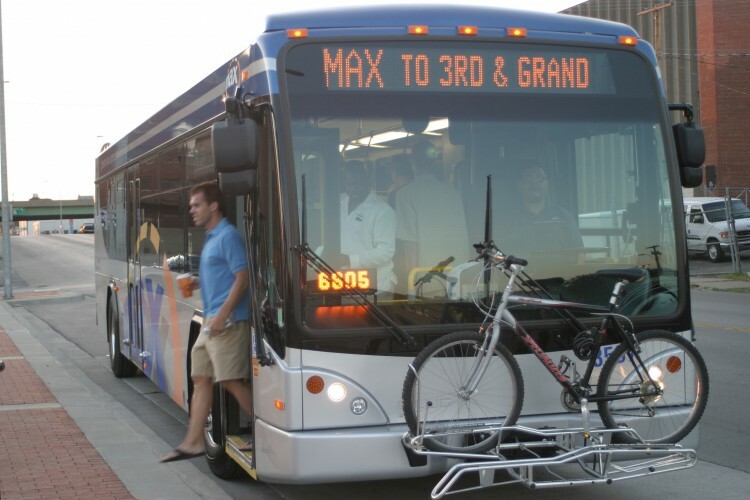 Grabbing attention from across the country and around the globe, Main Street MAX proved to be so popular that a sister bus rapid transit route was added on Troost Avenue in 2011 and another is planned for Prospect Avenue. Bus rapid transit lines, such as MAX, provided a middle ground between regular urban bus service and much more costly rail service. The success of Kansas City’s bus rapid transit service drew interest from across the county and the globe within the last decade. Officials from Jacksonville, Fla., Des Moines, Iowa, Columbus, Ohio and Minneapolis all visited Kansas City to look over its bus rapid transit line. A delegation from the Central Asian country of Turkmenistan, a former Soviet Republic, also looked over the MAX route while visiting the city.